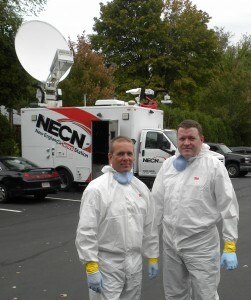 NECN broadcasted live from Armstrong Ambulance’s Arlington base to demonstrate our preparedness in dealing with potential Ebola cases. Our well trained crews, (along with SimMan), participated in a mock code where Ebola was suspected. Click the link to see BLS Clinical Supervisor Glen Biddiscombe, Field Operations Manager Davin Fors and Director of Clinical Services Stacy Gillis in action!